The morning came all to soon and I had a couple of hours to sit and enjoy the scenery whizzing by while the train headed for Ankara. The countryside reminded me somewhat of Spain – the same type of rustic greenery and ochre landscapes with the occasional village plopped down in the middle. No urban sprawl here! The train was over an hour late getting into the Ankara train station, so I decided to forego my plans to hit the Museum of Anatolian Civilization. It about killed me but I wanted to get to the Cappadocia region (pronounced “Kapadokia”) before dark and I know the bus ride would take 4-5 hours. Speaking of buses, Turkey has the bus system down to a science. Their bus terminals are called “otogars” and are huge – we’re talking airport terminal huge here (okay, maybe small city airport terminal). When I walked into Asti, the Ankara otogar, I couldn’t believe how large it was. There were almost 100 terminals and each had a different company, all going to various places in Turkey. I stopped at the Information desk and asked about buses to Goreme, and they directed me to number 51. The gentleman there gave me a ticket in return for 23 lira (around $17) and told me the next bus was leaving in an hour. Since I had time to kill I headed for one of the many restaurants and cafes in the terminal and had a glass of tea, which I am fast becoming addicted to. Turkish tea is served in a small hourglass-shaped glass with 2 cubes of sugar and a tiny spoon. It’s a lovely way to drink tea. Most shopkeepers will offer you tea if you’re in their shop for more than 5 minutes even if you don’t buy anything (of course, they’re hoping you will!). About 15 minutes before the bus was due to leave, I saw the bus pull into slot no. 41 so I made my way over there and boarded. Seats are assigned so I headed for mine and settled in comfortably. As I said, the Turks have this system down pat. As we drove down the road, the attendant (all buses have attendants as well as a driver) came by to spritz everyone with “freshening” cologne. Throughout the drive, he would serve tea or coffee periodically, and also passed out a little snack cake about halfway through the drive. The seats are extremely comfortable – reclining backs, foot rests and a little drop-down tray in front like airplanes have. We stopped about 1 pm for a bathroom/snack break. After that, they showed a movie on the drop-down video screens. The movie (an American movie called “Mr. Bones”) was dubbed in Turkish, but judging from what I saw I don’t think I missed much. At Nevsehir, we had to change buses – at this point, most of the people on the bus got off for good, and the only ones left were me, an Australian couple and a couple from Quebec. We got on a smaller bus and drove the short distance to Goreme. 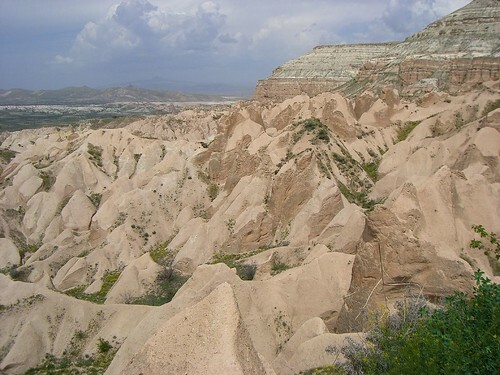 The first hint you see of the amazing landscape in this region comes about 5 minutes before you get into Goreme. This is when the “fairy chimneys” first appear in view. The bus dropped us off in the middle of town and the five of us headed to the Tourist Info Center to book a hotel. 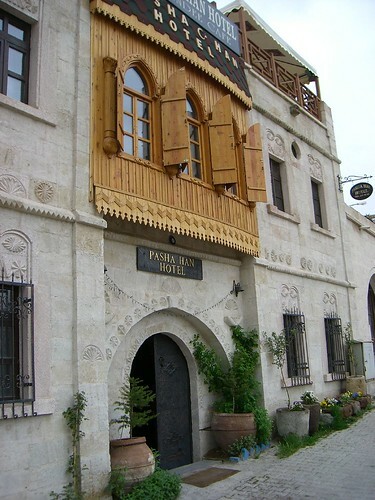 There are tons of places in town so I picked one at random recommended in Lonely Planet called the Pashahan Hotel (it was just included in the new version). What a gem this place was! It had the biggest most spacious room I’ve stayed in, and the price was a mere 30 euros (approximately $42), which included breakfast and free hot drinks thoughout the day. The owner, Sergio, even came to pick me up from the TIC. Best thing of all – the room had a huge bathtub! I love my baths and hate the fact that most hotels in Europe only offer showers, so this was a real treat. The hotel and rooms are decorated with dozens of carpets and Turkish art and gives an overall feeling of elegance. After checking in, I went out and wandered around for awhile. The town itself is very small and dense so all the shops and restaurants were close together. Everyone was extremely friendly but without the agression I found in Istanbul. I wandered into a couple of spots and then found an English-language used bookstore. The woman, Maggie, is an expatriate from Leedsö England, and has been here around 8-9 years. She recommended a restaurant called the “Local” and suggested I try the Ottoman chicken. So that was my next stop – since I really hadn’t eaten lunch, dinner was sounding pretty good. I soon found myself sitting on a lovely terrace outside the Local restaurant munching on Ottoman chicken (chicken rolled and baked with cheese), rice and vegetables, a glass of red wine – and the wonderful Turkish bread that I love. The owner came out to chat and said that after he had retired from his business, he came here to run a hotel and restaurant. After dinner, my feet directed me next door (again, thanks to Maggie’s recommendation) to some wonderful carrot cake made by a woman who just opened a cafe. She is from South Africa and her husband is a Turk and they just moved here from Capetown. Neither she nor her children speak Turkish (although they’re all learning now) but she seems to be taking the move in stride. Her father-in-law became sick, which is why they moved. I love the fact that these people will sit down and talk to their customers and are so friendly – it’s such a change from the somewhat sterile atmosphere of American restaurants. By this time, I was getting tired and made my way back to the hotel. As I walked in the door, Altan (Sergio’s friend and assistant) asked me if I wanted to join Sergio up on the terrace for a drink. I headed upstairs to the roof. Sergio and another friend (whose name I can’t remember) were sitting at a table and asked me to join them. He poured me a glass of wine and we all started talking. 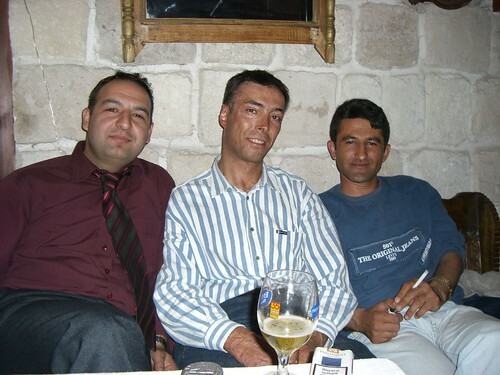 The friend spoke very little English (Turks learn English in school but many of them lose it if they don’t have contact with English speakers) and my Turkish is of course, practically non-existent, but we managed – mostly with Sergio translating. The glass of wine turned into another and another, and before long Sergio, Altan, Sergio’s friend, and me were all drinking and talking the night away. We discussed everything from restaurants in the United States to Turkish politics. In fact, at one point I asked them about the different clothing styles some of the religious women wear, and that embroiled a huge debate between Altan and Sergio, each yelling at the other and gesturing madly to emphasize their point. It was a lot of fun, especially spending time with local people. It doesn’t happen that often for travelers unless you happen to know someone, so I was appreciative of the time I got to spend with them. Eventually, we broke up the party and headed to bed, which, by the way, was extremely comfortable. Actually, every bed I’ve slept in in Turkey has been very comfy – the pillows are perfect and I love the Turkish duvets. It is similar to an American duvet in that it is a comforter covered by a duvet cover – however, rather than having a large one that overlaps all the sides of the bed, Turkish duvets fit squarely on top of the bed and line up with the edges (I’m not sure if this description makes sense – I’ll get a picture later). Whatever they do, it makes sense because I have loved every bed I’ve been in. And speaking of bed, I’m going there now. Oh, Sergio kindly lent me his laptop so that I could post this entry tonight. He is such a nice person! Tomorrow will be about one of my favorite days in Turkey so far – the ancient Christian churches of Goreme and my walk to the neighboring village. This entry was posted on May 9, 2007 at 3:56 pm	and is filed under Cappadocia, Fairy Chimneys, Goreme, Lonely Planet, Pashahan Hotel, Trains, Planes and ... Buses, Turkey. You can follow any responses to this entry through the RSS 2.0 feed. You can leave a response, or trackback from your own site.